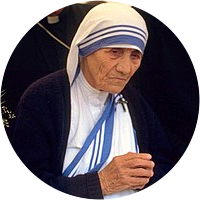 A collection of the best Mother Teresa quotations. Where there is a love, there is a joy. Let us always meet each other with a smile. It is not how much we do . . . but how much love we put in that action. There is hunger for ordinary bread, and there is hunger for love, for kindness, for thoughtfulness; and this is the great poverty. The worst illness today is not leprosy or tuberculosis, but the sense of being unwanted, of not being loved, of being abandoned by all. Duty is a very personal thing. It is what comes from knowing the need to take action and not just a need to urge others to do something. Charity, to be fruitful, must cost us. Give until it hurts. To love it is necessary to give; to give it is necessary to be free from selfishness. Riches, both material and spiritual, can choke you if you do not use them fairly. For not even God can put anything in a heart that is already full. There must be a reason why some people can afford to live well. They must have worked for it. I only feel angry when I see waste. When I see people throwing away things we could see. Sweetest Lord, make me appreciative of the dignity of my high vocation, and its many responsibilities. Never permit me to disgrace it by giving way to coldness, unkindness, or impatience.